Roethlisberger started his third consecutive preseason game, played the first two series and once again led them to three points, the third time in three games he has done that. This time, though, Roethlisberger did it against Carolina’s second-team defense. Roethlisberger completed 4 of 6 passes for 39 yards before he gave way to Leftwich with 53 seconds left in the first quarter. Roethlisberger came out working in the no-huddle offense to start things. He was forced to scramble up the middle for one-yard to start the drive and Rashard Mendenhall went off left guard for six yards. On third and three Roethlisberger was able to pull in Maurkice Pouncey’s high shotgun snap, but couldn’t recover and was sacked for a 10-yard loss. On third-and-17 Roethlisberger hit Arnaz Battle for 16-yards, with his knee ruled down before getting the first down. The Steelers went for it on fourth-and-one and Mendenhall delivered with a nine-yard run up the middle. Roethlisberger connected with Heath Miller for 13 yards and Mendenhall continued to move the ball with carries of four and five yards. Mewelde Moore moved the chains going off left guard for four yards. A holding call negated an 11-yard run by Moore and an incomplete pass gave the Steelers second-and-20 from the Panthers 25-yard line. Roethlisberger hit Moore for seven yards and Battle for three, but they weren’t able to convert the first down. Jeff Reed got them on the board with a 33-yard field goal for a 3-0 lead. You can read their full game summary here. Steelers quarterback Byron Leftwich sprained his left knee in the second quarter Thursday night as Pittsburgh beat the starter-less Carolina Panthers 19-3. Leftwich (4 of 6, 39 yards) was hurt on an 18-yard completion to Emmanuel Sanders as running back Mewelde Moore and safety Marcus Hudson collided near him with 10:25 remaining in the first half. Leftwich immediately clutched his knee in pain. While Dixon talked to reporters, Roethlisberger — leaving the Steelers’ locker room for the last time in at least a month — leaned close and offered words of encouragement. Roethlisberger will meet Friday with NFL commissioner Roger Goodell to learn if his suspension for off-field behavior will be reduced to four games, as expected, or stay at six games. You can check out the Post-Gazette’s slideshow from the game here. You can check out more photos here (pages 1 & 2). NFL Network will re-air it on Saturday, September 4th at 8:00 pm, and again on Tuesday, September 7th at 8:00 a.m.
Ben’s suspension reduced to four games…. (AP) Ben Roethlisberger’s suspension has been reduced from six games to four by NFL Commissioner Roger Goodell. 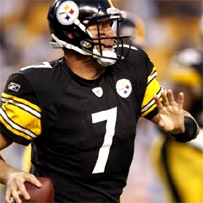 The Steelers’ star quarterback met with Goodell early today and was told he could return on Oct. 17 against Cleveland. While suspended, he must stay away from the Steelers facility completely and have no contact with the coaches or front office. He can talk to teammates, but not about Steelers-related matters. He can not participate in team-related activities. Roethlisberger is the first player suspended by Goodell under the NFL’s personal conduct policy who was not arrested, charged with or convicted of a crime. What will Ben do during his time away? This weekend, he’s going to re-group with close friends and former Steelers running back and current ESPN analyst Merrill Hoge, who has become his mentor.